Entertainment Media Research weren't the only people publishing results of a survey of digital music listeners yesterday (see yesterday's post). 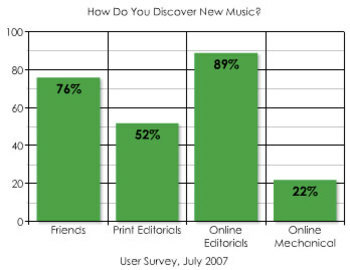 On a slightly smaller scale, The Hype Machine — an aggregator of music blogs that many consider a prime indicator of "buzz" in new music — produced their figures for how their users like to discover music. I took part in this survey a few weeks ago. I can't remember exactly how the question was phrased or whether the options were expressed as in this chart — I thought there were more of them, and neither radio or TV are mentioned here. But I do remember that I ticked all of the options that were available. Judging from the Hype Machine chart (reproduced here), most people ticked several options. Which is obvious when you think about it. Only the most avid fans actually spend time setting out to discover new music. The rest of the music listening world is going about their lives, trying to keep themselves amused with some music on in the background, or just killing time on the web, when they happen to come across something that takes their fancy and is worth exploring more. That could come about from talking to friends, reading a magazine or a blog, or just walking the street. Anyone would be daft to rule out any of these sources as paths to discovery. 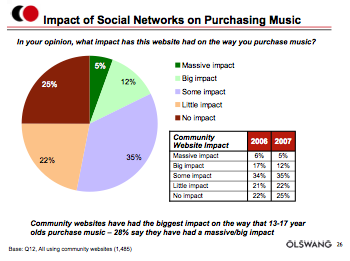 It may not yet be a flood, but the role of social networks like MySpace and Bebo in spreading the word about new music by online word of mouth has increased quickly from a trickle to a stream, and shows no signs of slowing down. That's one of several interesting conclusions from the annual UK Digital Music Survey by Entertainment Media Research and Olswang, published today. I found last year's survey really useful, and wrote about its findings on social networks and discovery. This year's survey report is even better because it includes a lot of trend data, comparing results year on year. You can download the full report for free (in PDF slide format). Last year I featured the statistics on sources of discovery, showing radio and music television still leading the pack, followed by friends' recommendations and social networks influential mainly with teenagers. This year radio and TV are down, word of mouth and social networks are up — though the former are still most important overall. What's interesting is that some patterns seem to remain consistent while other factors change. From the chart above, you can see that it's not that social networks have become more influential with their users: there's no significant change in impact. It's just that there are a lot more people spending more time on MySpace and Bebo year on year. And again it's the younger age groups that are leading this trend. "Ain't singing for Pepsi, Ain't singing for Coke, I won't sing for nobody [who] makes me look like a joke," sang Neil Young a couple of decades ago. But can doing a deal with the ad-men help convince an audience that you're the Real Thing? Music Week has fifteen minutes of video interviews with participants in last week's Music Meets Brands event: access to the article requires subscription, but non-subscribers may be able to go straight to the video. One of the interviewees (5 mins 45 secs in) is Pete Hutchison of Peacefrog Records, who talks about how his label has sold synchronisation ('sync') licenses for their artists' music. The most famous example of this is the use of José González's recording of Heartbeats in a Sony Bravia advert that got people talking — see below. Later on part of his solution runs, "So, how do you spread the word? You don’t. Your audience does." Read on for the full analysis. The Observer Music Monthly has a seven-minute video feature and debate asking, "Are record labels crushing real music — or does technology mean artists will take control". Several of the points made by different people in the video will be familiar to anyone who's been following this area. There's a widespread recognition that artists and creators now have many routes to being discovered by an audience. 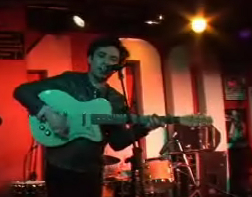 Hence labels, who are having a tough time making money out of new recordings, are not the be-all and end-all for artists like Pete Molinari (pictured). Also Adam White of Universal Music observes that what's happened so far is only the beginning of the impact of the net. There are a couple of references to how well the live music sector is doing. In the Music 2.0 era, we don't often focus much attention on live gigs as a route to discovery, but they surely do serve this purpose: that's why a good festival slot or a support slot for a major band is much coveted by new artists. But the dynamics of live and recorded music have completely flip-flopped in the last quarter of a century. BBC Radio 4 has a 30-minute programme on the history of the UK music press from the 1970s and '80s through to the present day. The last ten minutes looks at the future prospects for press and the critics in the age of MySpace. 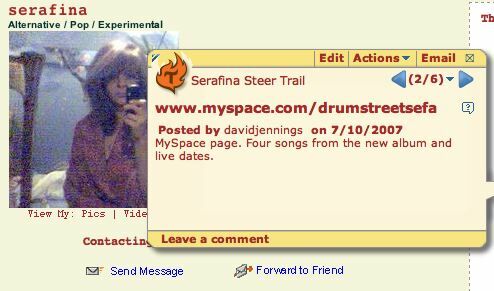 Journalist Tom Artrocker wants to put MySpace in its place, arguing that it has its use as on-demand resource for checking out new music instantly, but does not itself lead to anyone discovering anything. 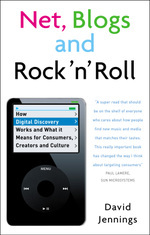 He argues that professional media played a more critical role in breaking the Arctic Monkeys than MySpace (see my comments on this last year, and I broadly back the specifics of that account in my book). But he goes on: "without people to do the filtering, it's a mess, it's chaos, it's anarchy — I do maintain that no new band of any value at all has been discovered through MySpace." Well, there's nothing actually stopping a new band being discovered through MySpace or other social networks. Even if it hasn't happened yet, it will. And what's wrong with a bit of anarchy? Paul Morley is good value as usual, highlighting the determination among music critics, professional and amateur, to get there first to the new bands, and thereby stake their claim to being in the vanguard of taste. 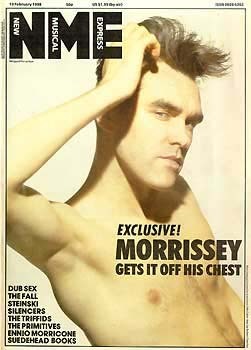 He blames this for some of the over-hyping in the press and in blogs. The essential motivation for all rock writing is to discover things before everyone else, and then of course to be disappointed when everyone else discovers them. At the moment what slightly saddens me from the rock writer point of view is that there's no value given to you finding it… [the new bands] are set up to be so extraordinary that there must be a constant sense of disappointment; and I think that slight sense of everything being celebrated to such an extent must ultimately start to crumble a little bit. People will start to realise that they're being over-egged and over-excited, on the basis, ultimately, that they're going to spend some money. Listen to the full show until at least 21 July. Tom Artrocker section starts about 20'15" in; the above Paul Morley extract begins at around 23'30", and he's also on at 12'05". 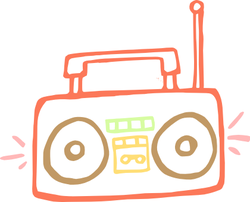 I wrote in my last post about Music of Interest as a tool that aids the process of 'free range' discovery as you roam around the net, picking up clues and pointers about music you might want to explore in greater detail. There's an encouraging growth in these kinds of tools, each of which is modest in the sense that it seeks only to do one or two things, but to do them well. I find out about a lot of these tools by reading Jay Cross, who has done a lot of spadework in mapping and defining the field of informal learning in recent years. (Jay's focus is on learning related to the workplace, but informal self-directed learning clearly applies even more in relation to our hobbies and leisure interests.) Jay is also an inveterate tinkerer with the latest online applications and widgets and posted recently to demonstrate the use of Trailfire for creating annotated journeys through the web. There's a thoughtful piece by Graeme Thomson in the current issue of Word magazine about what happens when you stop trying to block out all the music that comes to you unbidden as you make your way about a city and actually listen to it instead. The result, Thomson argues, is a form of 'playlist' that is more random, and has greater capacity to surprise, enchant and educate, than that on any iPod. I could have been listening to my own selections during this time and probably heard what I'd normally consider to be better songs, but most of it would have been music I already know intimately and which inspires a Pavlovian reaction… I'm getting a bit weary of anything that arrives "pre-approved", even if it's me who is doing the approving. I like this. Firstly it's a counterbalance to various slightly questionable research suggesting that consumers place a premium on control over their media. We do like control much, or even most, of the time; but we also need to let go some of the time, to open ourselves to chance and spontaneity. Second its suggestive of how the discovery process — finding music and media that is new to us — can be most vivid when it's feral and anarchic. More on this another day. Obviously I'm under an injunction to practise what I preach, so that means lots of blogging and social networking. I'm sure some sections of the text will also be available online, but we haven't sorted that out just yet. Today I signed up with Bebo. I'm not sure how well known Bebo is in the US, but in the UK it is either catching up with MySpace or already overtook it a year ago, depending on your measures and sources. I'm completely friendless on Bebo at the moment, so if you have an account there please visit my profile and befriend me. One of the unique (among the networks I've used) things about Bebo is that it provides a platforms for authors to promote books in the same way that bands promote music. 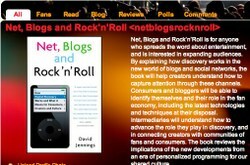 Hence I've been able to create an initial page for Net, Blogs and Rock'n'Roll. Watch that space, as well as this one.